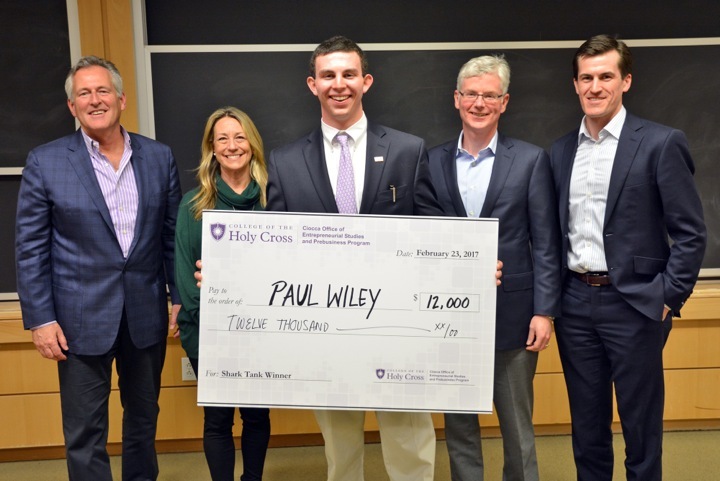 Paul Wiley, a freshman, is the distinguished winner of the College of the Holy Cross Shark Tank Competition and a prize of $12,000. A member of the class of 2020, Paul pitched his business, PW Industries, to four judges: Ed McLaughlin, April Lukasik, Tom Flynn, and Bryan Sparks. PW Industries, which specializes in custom, handcrafted executive products and jewelry for the promotional products industry has realized a profit from the get-go. Paul’s prize package includes: $12,000, an alumni mentor, and a year-long membership at Worcester Clean Tech Incubator (WCTI), Venture Forum, and the Worcester Chamber of Commerce. It was my honor and pleasure to participate as a judge, impart advice to budding entrepreneurs, and witness the great entrepreneurial enthusiasm of the Holy Cross student body and faculty. Thank you to David Chu, Head of the Holy Cross Pre-Business Program. I also want to acknowledge the other two impressive student entrepreneurs who pitched their businesses, Dylan Oliveira and Mary Kate Vanecko, both of the class of 2017. 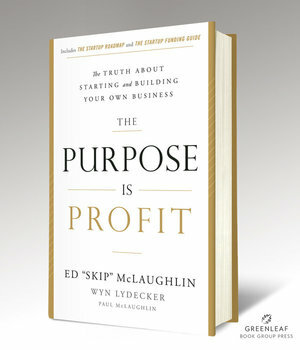 Ed “Skip” McLaughlin is the author of The Purpose Is Profit: The Truth about Starting and Building Your Own Business, along with co-authors Wyn Lydecker and Paul McLaughlin. The Purpose Is Profit is available on Amazon.com and at your favorite bookstore now. Ed McLaughlin is the founder of four businesses and is currently running Blue Sunsets LLC, a real estate and angel investment firm based in Darien, CT. Follow him at @purposeisprofit.